The protest this coming Thursday 20 July will likely be the biggest in the Rif, Morocco, since the popular movement – al-Hirak al-Sh’abi (Hirak for short) – began there in October last year. The long anticipated 20 July will be crucial test of Hirak’s power in the Rif, following the increased state repression from late May onwards. The October and November protests were a mass reaction against the alleged police killing of fish merchant Mohasin Fikri for refusing to pay a bribe in al-Hoceima, the region’s capital and epicentre of Hirak. Those first demonstrations – there were protests in Rabat and Casablanca too — were against al-Hugra: ‘abuse’, or state corruption and violence. Then, activists began developing a series of demands that on their March release only grew the movement. The working class movement’s demands are social – for ‘a university, a hospital, and work’, as they’re popularly summarised – rather than political, with the republican (i.e. 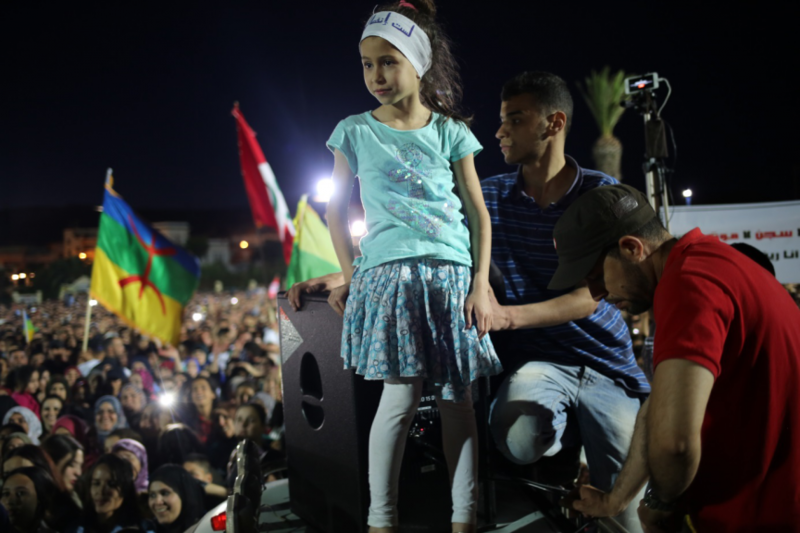 separatist) tendency in the Rif and in Hirak remaining, for the moment, purposefully quiet; republicanism might split the base, and would assuredly invite a much harder state response. The base of the movement grew through the spring; the Makhzan – the popular word for the ‘hidden’, ‘illegitimate’, ‘real’ power in the country – was working against it through relatively light policing, through the press and, as proved decisive, through the Ministry of Religious Affairs. On 28 May, the imam of the biggest mosque in al-Hoceima was reading a state approved sermon (‘Security is a Blessing’); the de facto leader of Hirak, Nasser al-Zafzafi, interrupted the sermon by asking whether ‘mosques are houses of God or of the Makhzan?’ thereby provoking a tumult of repression that, together with the protests against it, inaugurated phase two of Hirak; Al-Zafzafi and scores of other activists were arrested that weekend alone, as reported by Amnesty. Hirak has been front page news in Morocco through June but, over the two weeks of quiet much of the European press lost interest. The political economy of Hirak was brilliantly explained recently by Nadir Bouhmouch and Elia Terrass , as was the Rifian specificity of the movement by Hicham Aidi. Appreciating the past six weeks of politics will be crucial to understanding Thursday and its aftermath. So what’s been happening between Hirak and the Makhzan in June and July? How has repression effected Hirak? Police and protestors in al-Hoceima on eid al-Fitr, the first day of shawal after Ramadan, 26 June. The ‘decapitation’ policy begun in late May – arrest the leadership – left the movement less organised than it was: some of the mass strikes called in June against the repression in al-Hoceima held, others didn’t, and the size of the demonstrations were down against May. But they became much more numerous, with protests in the working class neighbourhoods of al-Hoceima almost nightly throughout the month. Sharp in the first half of June, they got sharper after the first verdicts against activists were announced on the 14th, with protesters saying on the 15th ‘silmiya; c’est finis’ (‘pacificsm; it’s over’). In fact, protesters’ violence has since remained overwhelmingly defensive, unlike the state’s: speeding riot vans, baton charges, gas attacks, and so on became commonplace for thousands of people in al-Hoceima and Imzouren. At the national level, the increased repression galvanised support for Hirak outside of the Rif, with the broad opposition solidarity protests on 11 June in Rabat; the biggest demonstration in the region since 2011 (see here for an analysis of the event’s politics). The radical left, progressive sections of the trade unions, and the biggest Islamist group are all supportive of Hirak. Supportive, but not ‘part of’, with Hirak having consistently refused to work with any political party or trade union. After decades of experience, the “Rifian population is sceptical of individuals or groups pretending to serve the common good”, as one activist has said. Nightly protests continued in al-Hoceima until the end of Ramadan. 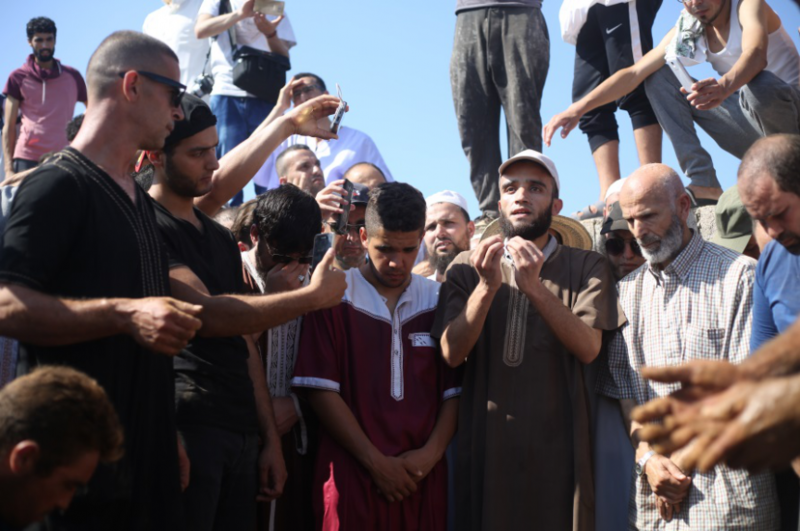 On Monday 26 June – ‘Black Eid’ – the daytime protest was the most violently repressed yet, with le desk describing the town as ‘in a state of siege’: 93 people were detained, and 40 children were hospitalised, with about the same number of police officers injured. The repression both disorganised and galvanized Hirak, and the mass arrests have created a problem for the Makhzan. They were arrested because they were dangerous; an abrupt release would gift the movement experienced leaders, organisers, journalists. But, a more drawn out series of releases requires time the Makhzan doesn’t have – or, at least, will have to fight for – with protests against detention in Rabat and Casablanaca, as driven by relatives and comrades, unlikely to end. 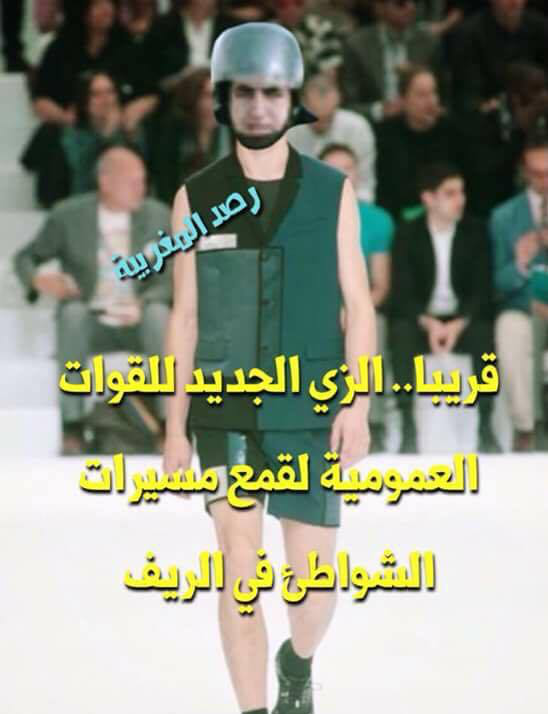 “Coming soon … the security services’ new gear for repressing seaside protests in the Rif”. Rassd Maroc’s meme ridiculing the state’s repressing of a beach side protest near al-Hoceima on the 2 July. In early June the supine press and state officials were describing Hirak as both separatists and religious extremists, but into July have begun giving more placatory signals, with the head of the governing coalition saying on Saturday 8 July that accusations of ‘separatism’ were incorrect. Much of the press appeared to panic in late May, with the pro-regime daily Al-Sabah (for example) successively claiming that the movement is funded by Daesh, by drugs gangs, then by the Polisario (the Western Sahara national liberation organisation) all of which seemed less doubtful than amateurish. The Makhzani press went too hard, too soon, but the shift away from such aggressive rhetoric – comparing al-Zafzafi to al-Baghdadi, for example – has been too quick to seem much but cynical. Professional news sites like le desk and lakome have also been publishing consistently excellent journalism, with writers and editors risking censure and indeed prison; Mohamed El Hilali et Abdelouahed Kammouni of Rif Press was recently sentenced to five months. A satisfying anti-Hirak narrative has yet to appear; the press had the accusations of ‘separatist’ and ‘religious extremist’ ready to fling, but neither stuck, in part because neither is true. Since then there have been attempts at appearing to accept the legitimacy of the movement, but the about face came too soon and, after all, while arrests continued. This isn’t to say that the Makhzani press has been good for Hirak, but it could have been much worse for it. With both negative and positive spin exhausted, the most obvious Makhzani press’ play for the 20th is silence. El Mortada Iamrachen, palms to the sky, at his father’s funeral, who died shortly after his son’s arrest. El Mortada was granted temporary release to attend the service, with activists blaming the police for his father’s death. Al-Zafzafi’s sermon interruption was an extraordinary contesting of the state’s relationship to religion; in June, another arrest suggested again that the Makhzan’s control over religion is both entrenched and brittle. The prominent Hirak activist el-Mortada Iamrachen renounced his salafi past several years ago, and now calls for a rights based state with protections for religious minorities, including atheists. Iamrachen has consistently argued for a negotiated settlement of the dispute, and is perhaps the best known Hirak moderate. Why arrest him on terrorism charges? The first theory is that the Makhzan is intensely concerned with how Washington, Brussels, and especially Paris view the country; it has to be, not least since tourism is now the single biggest source of foreign exchange. The obvious media strategy has been to go with the grain of American and European Islamophobia, and represented Hirak as both very small and very ‘extreme’. That Iamrachen is famous as an ex, and indeed anti, salafi would hardly matter since, as one activist in Rabat said, “people will read the headlines and look at this picture; his look is the important thing”. The second theory is that Iamrachen’s sense of the proper relationship between politics and religion – that they are related and separable – is both implicitly anti-regime and nationally popular. He was well known across Morocco before Hirak too, making him one of the people most able to expand the movement beyond the Rif. Religious figures should either be AK-wielding jihadis, or under the authority of the Makhzan. Iamrachen is neither; hence his arrest. Religion is only one aspect of the movement: there are individual atheists, and a strong current calling for a ‘civil state’. But, it the question of ‘which Islam?’, and especially how the state ought to relate to religion, will continue to be posed by Hirak. ‘Gentle, shy and obedient’? Women’s fight. 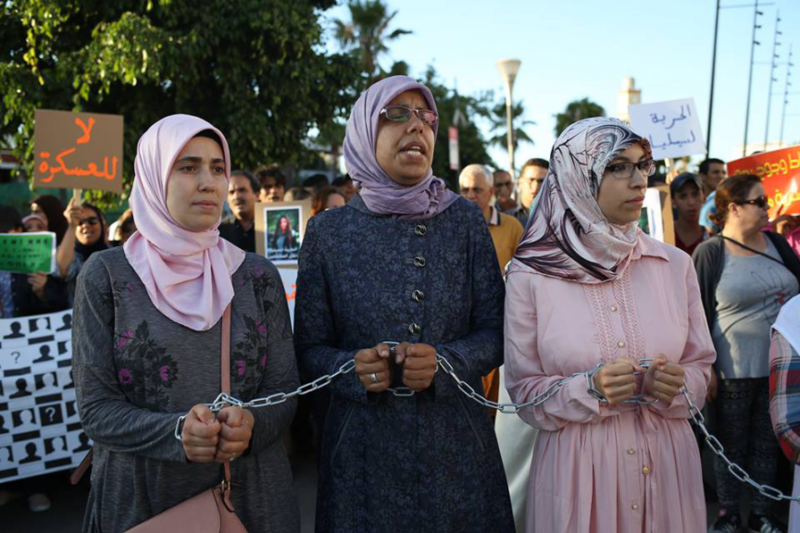 Three protestors at a ‘Moroccan Women Against Political Arrests’ demonstration, Casablanca, 7th July. “In the Rif, women could not pass by windows”, one male leftist said to me in Rabat. But this appears to be changing rapidly in the Rif, with women activists clearly crucial to the movement. On 19 June, three girls were temporarily detained in al-Hoceima for having shared a video calling for another women’s protest; at least one woman has been sexually assaulted by police, and police have told detainees that “Rifian girls should be gentle, shy and obedient”, and “must stay at home like (their) mothers used to”. As with religion, the state must appear as the face of ‘proper’ feminism and so, as with religious dissent, must block, repress, neglect, or co-opt any feminist effort independent of it; that they deployed women police in al-Hoceima at certain protests shows that the regime is not unaware of the gender politics of dissent. Moroccan Women Against Political Arrests are working to build international, women-led solidarity with Hirak. Their first demonstration in Casablanca on the 7 July drew hundreds of people; the police’s violence against their Rabat demonstration on 8 July – they attacked the protest, punched people down, kicked them in the head – shows how seriously the regime takes grassroots feminism. A protest in al-Hoceima, mid-March. The violence and defamation through June and July has put limits on what the Makhzan can do against this Thursday 20 July’s protest. More violence and arrests will only compound the problem. Unlike the Makhzani media, the police can’t simply ignore Thursday, but an overreaction might be disastrous. Reflecting on the failures the police, the press, and the various parliamentarians that have attempted to intervene in the Hirak crisis since May, the US-based analyst Hassan Masiky said on 28 June that there is “no capable and popular political leadership outside the Royal institutions”; the king’s coming intervention may prove decisive. But, can the Makhzan rely on the widespread sense that the king is ‘above politics’, as Masiky hopes, and so able to do what mere ministers can’t? Possibly. But, with protestors chanting ‘long live the people’ against the police’s ‘long live the king’, this is a time of change and of danger for the court. The sense that king Mohamed VI is less above politics than at the centre of it – less a benevolent king than an ever less dressed emperor – has palpably grown over the last six weeks, with his authority as head and figurehead of Morocco discussed as never before, especially in regards to religion. 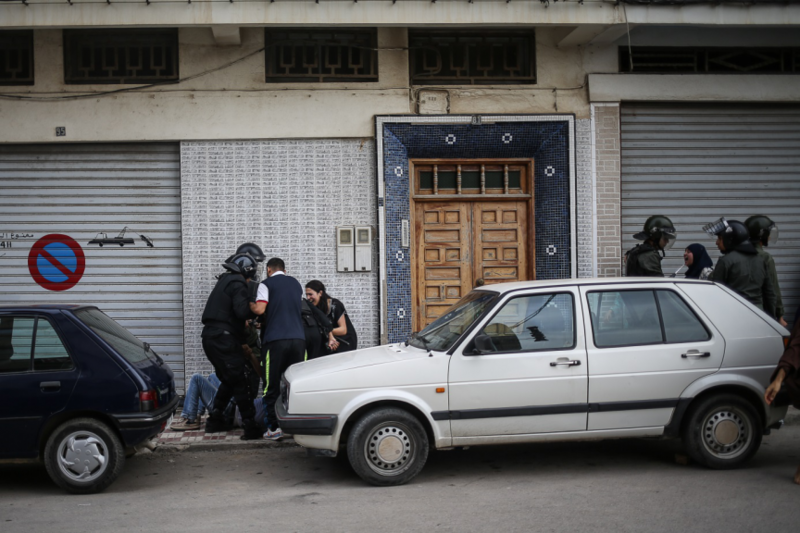 There’s been quiet over the past two weeks, with the press reporting a partial withdrawal of uniformed police from al-Hoceima, though activists in the town have seen a corresponding rise of plain clothed officers. With beatings, detentions, arrests, and sentencing still continuing – and the social conditions being protested unchanged – this week’s quiet, like the police’s plain clothes, are only barely beguiling. Ash Sarkar examines how a state-sponsored distrust of 'Muslimness' in the west has led to the emergence of new racisms, blurring the boundaries between scientific and cultural definitions. On this week's show Aaron Bastani is joined by Saul Newman as they discuss the relationship between anarchism and the 'new social movements', specifically after 1989.